Be prepared to take on any challenge in the 2017 Ford F-150 XL. This stunning model comes with either two or four doors, and seating for up to six, offering you the space you need for the day ahead. If you’re looking for a basic work truck that focuses on the job at hand and not unnecessary frills, this XL is right for you as it combines practical ergonomics with advanced functionality. With a focus on function, the 2017 Ford F-150 XL delivers on every aspect. Black bumpers and front fascia, as well as the black grille and surround, showcase the aggressive stance of the truck as you arrive with an impressive reputation. Halogen headlights brighten your way so that you are able to see and be seen in a variety of outside conditions. Enjoy the functionality of the cargo light, making working after dark a simple task. Practical design continues inside the 2017 Ford F-150 XL as you embrace the black vinyl flooring and the option of vinyl seats for easy clean up and care. While a bench seat comes standard on this model, you can upgrade to bucket seats with unique perforated leather-trimming, featuring a flow-through centre console for added luxury and convenience. Take advantage of the 60/40 flip-up split rear bench seats as you bring along everyone and everything you desire. Available cruise control and power doors enhance your experience as you focus on the important part of your day, and let your truck worry about the rest. 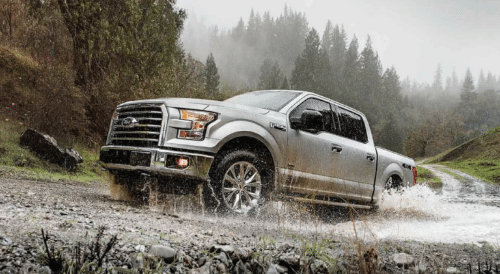 When you drive the 2017 Ford F-150 XL, you are kept aware of your surroundings, as well as given an opportunity to stay connected to the outside world. Always know what’s going on with the 2.3" productivity screen, offering up-to-date information. Entertainment is provided through the standard stereo system with AM/FM, or through the available SYNC 3 infotainment system with added SiriusXM satellite radio access to make your journeys more enjoyable. Enhance the look and function of the 2017 Ford F-150 XL with the right accessories. 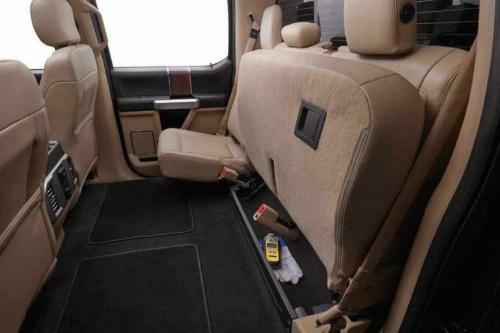 With the addition of running boards you are given easier access to the cabin. Heated mirrors and power adjust trailer tow side mirrors are also optional to add on for practical purposes and to keep you aware of the space around you no matter what you tow. Protect the box of your truck with a bedliner while the BoxLink cargo management system keeps tools and equipment safe. For a unique look, you can also switch out the black bumpers for chrome and expect to turn heads everywhere you go. Experience supreme power for any job with the 2017 Ford F-150 XL. 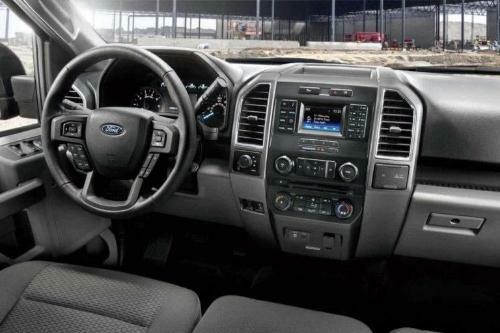 This model comes with your choice of four engines, including two EcoBoost options for superior efficiency. Automatic stop/start technology helps you conserve fuel when you’re sitting at a traffic light. All engines are paired with the SelectShift automatic transmission which comes with progressive range select or an electronic ten-speed transmission with sport and tow/haul modes. With its available 4x4 mode, you can go anywhere. 2.7L V6 EcoBoost 4x2 3.73 13,300 lbs. 8500 lbs. 3.73 13,300 lbs. 8400 lbs. 3.5L V6 EcoBoost 4x2 3.73 17,100 lbs. 12,100 lbs. Enjoy all the 2017 Ford F-150 XL has to offer with its award-winning design. Advanced safety features make driving the 2017 Ford F-150 XL safe and fun. Every 2017 Ford F-150 XL comes with an outstanding warranty. The 2017 Ford F-150 XL provides everything you need and nothing you don’t want for your everyday work truck. At the same time, it provides impressive safety, comfort and convenience to make your workday a little easier. Partner with an award-winning truck to enhance your productivity. Find out how the 2017 Ford F-150 XL when you visit your local Vernon Ford Dealer – Watkin Motors Ford. Come in and check out all our Ford trucks. Pick one out with all of the features that meet your needs. 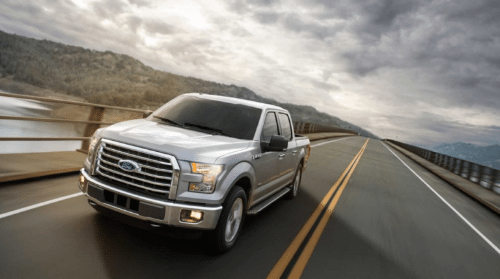 Trust Watkin Motors Ford to help you make the right choice on a truck that is Built Ford Tough.